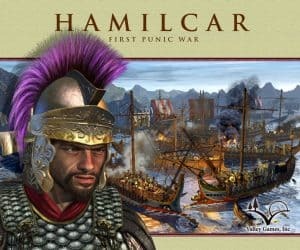 Hamilcar – First Punic War is an expansion for Hannibal: Rome vs. Carthage. Designed by Mark Simonitch and John Rodriguez, Hamilcar takes you back to the First Punic War where Hamilcar (Hannibal’s Dad), is running the show… and Rome isn’t very happy about that! Remember, this is an expansion. You will need to own Hannibal: Rome vs. Carthage to enjoy this rather extensive expansion. The artwork in the game and the box cover are once again courtesy of award-winning artist, Kurt Miller. So for the million dollar question “When will it be released?” Well, we are going to get you to tell us. Pre-ordering the Hamilcar expansion is simple. Just email us at and tell us that you’re interested. THAT IS IT! Simply include your full name and an email address where you would like to be reached when the game is finished. If enough people express interest, we’ll print it and then let you know when the game is finished. If you pre-order, you’ll receive 40%off the game when it’s ready for sale, but only through our online store. There is ABSOLUTELY NO OBLIGATION on your part — even if you express interest by emailing us! We simply want to know how many of you would like to continue the exploration of The Punic Wars. If you have any questions or comments please feel free to email us directly. We are going to start this off with the first general on this post and he is P.C. Scipio Nasica, who ironically suggested that Rome save Carthage instead of destroying it as he thought it would help to prevent the deterioration of Roman morals and discipline. Special Ability: If on unfriendly Tribe, inflicts Subjugation Points equal to CUs lost during the Winter Attrition phase. More Generals will be released every couple days so check back often!